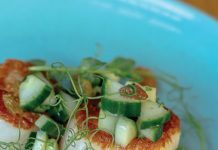 Home COLUMNS & FEATURES HIP HOPS— Goodwood Brewing Co.
HIP HOPS— Goodwood Brewing Co. It is a deceptively simple notion to modify the flavor of beer by aging it in Bourbon barrels. Just as char and time transform simpler corn-based spirits into a sipper’s elixir, so a barrel’s second use with beer can create a characterful hybrid, balancing the chosen base beer with notes of vanilla and spices. This principle holds true when using barrels previously filled with other liquors or wine, and to a more subtle extent, by exposing beer to various types of wood (most often oak) through chips or spirals. Currently there are at least 4,200 breweries in America, and many of them have experimented with wood during the aging process. Often these are small batches for limited release, though Alltech’s Kentucky Bourbon Barrel Ale is a flagship, available year-round. Then there is Goodwood Brewing Company, where all of its beers are touched by wood and brewed with limestone water. 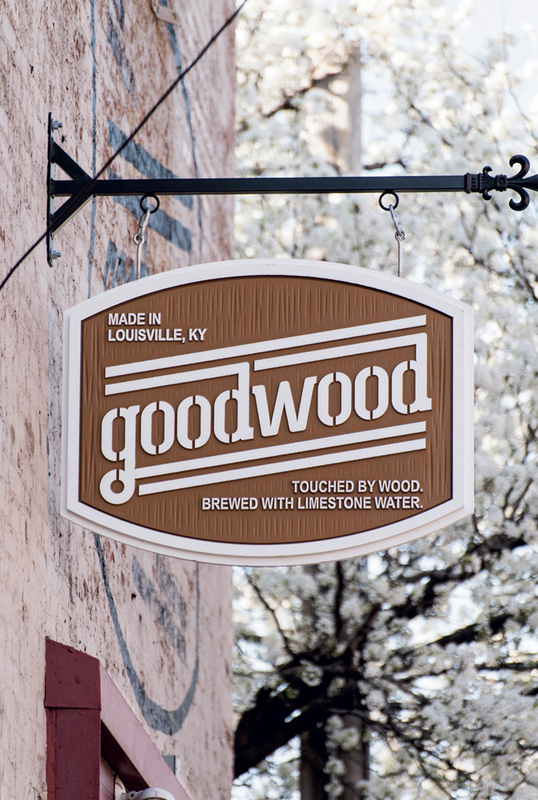 Goodwood’s identity dates to 2015 and a rebranding of the entity once noted for brewing Bluegrass Brewing Company’s beers under license for packaging and distribution. The brewery’s new name is fully intentional, meant to inform beer lovers of the roles played by wood and water. In fact, beer and Bourbon are grain-based cousins, beginning life similarly during the mashing stage, then diverging into fermented and distilled forms. 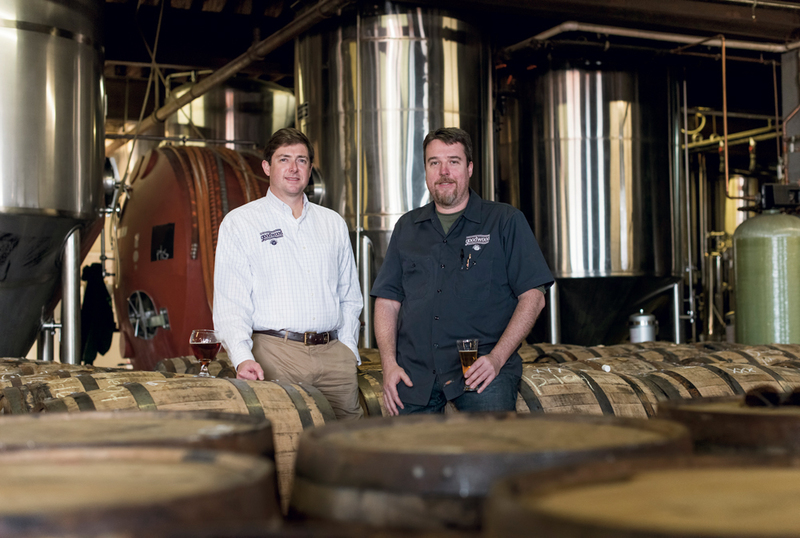 Goodwood’s aim of reinserting beer into a Bourbon-based equation may strike some as audacious. Others will find it a delightfully appropriate adaptive reuse, both for barrels and ideas. Goodwood occupies an old industrial warehouse at 636 East Main Street in downtown Louisville. Beer has been brewed there since Pipkin Brewing Company opened in 1998, and in fact, Pipkin produced Louisville’s first Bourbon Barrel Stout in 2001. In 2006, BBC began brewing its Jefferson’s Reserve Bourbon Stout here. It was a mainstay in markets outside Kentucky, and remains the basis of Goodwood Bourbon Barrel Stout. Goodwood’s stretch of Main Street used to be lonely unless the Louisville Bats Triple-A baseball club was playing at Louisville Slugger Field, a few hundred yards to the west. These days the area is changing, and fast. Angel’s Envy distillery will open soon opposite the ballpark, and the burgeoning NuLu district lies a block away to the southeast. A 200-unit upscale apartment complex is rising directly across from Goodwood, and adjacent industrial acreage is for sale, likely destined for residential construction. Inside Goodwood, there is a tap room and production area packed with stainless-steel brewing and fermenting vessels. Upstairs is a vast space that might someday host special events. In the basement, dozens of barrels are lined in repose. The barrels are used only once by Goodwood, and before being filled, must be closely sniffed, inspected and tested for contamination. Beer remains in the barrel for 30 to 90 days, depending on the type. Goodwood’s aged-in-the-barrel line includes Bourbon Barrel Stout and Bourbon Barrel Ale, as well as Red Wine Barrel Saison and Brandy Barrel Barbarian Honey Ale. Among those aged “on” wood are Louisville Lager (ash), Pale Ale (poplar) and Walnut Brown Ale (walnut). Intriguingly, a seasonal IPA is planned, with an uncommon twist of aging “on” native aromatic cedar. The Goodwood line of beers is available in Kentucky, Indiana, Tennessee, Ohio and Virginia, and with other states queued and ready for their share, Mitzlaff has a plan to serve them. It is called Paristown Pointe, a $28 million project to be located approximately a mile away from Goodwood’s current location on a patch of ground where Barret Avenue meets East Broadway. Paristown Pointe is a certifiably ambitious neighborhood redevelopment proposal involving multiple investors who are seeking to leverage state tourism tax credits to create an arts and culture district. Plans call for an enlarged Louisville Stoneware factory, a multi-use theater for the Kentucky Center for the Arts, renovated housing, commercial space…and, yes, a new Goodwood brewery. Make no mistake: 70,000 barrels is a substantial amount of beer. It represents a potential brewing capacity four times larger than Goodwood has today. In 2014, a craft brewery producing this much beer would have placed 44th in production for the entire country. Yet such a rate of growth has ample precedent in craft brewing, and Good-wood’s rebranded identity can only be enhanced by participation in what might be a nationally celebrated redevelopment project. Goodwood’s brewery at Paristown Pointe will concentrate on aged-in-the-barrel beers, and will boast a fully automated brew house as well as both bottling and canning lines. If all goes according to plan, brewing will start in summer 2017.